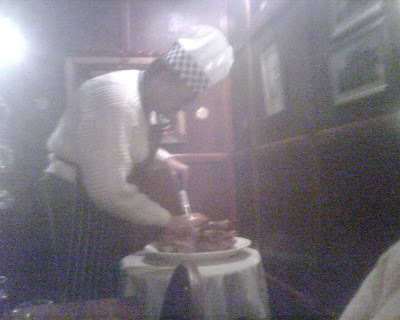 Last night a small group of us had Christmas dinner at the wonderful Robin Hood Pub in Bluebell Hill and it was amazing! They bought out a picture perfect bronzed turkey for us to carve ourselves along with a never ending supply of the usual trimmings. Adrian drew the short straw and donned on the chef's hat and apron to carve but allegedly the knife wasn't sharp enough (bad workman??) so it was whisked back into the kitchen for the Chef to do the honours. I left happy and very full and if you are looking for somewhere local to have Christmas dinner would definitely recommend a trip to the Robin Hood.